My family and friends know I love to shop online. Especially on Amazon. My UPS guy and mail carrier knows it, too. Believe me, they are delivering packages here several times a week. Every week. I’m also a social media addict lover, with Twitter being at the top of the list. If you check out my Twitter profile you’ll see that I have tweeted out over 62,000 tweets. That’s a lot of tweets. When I heard that Amazon and Twitter were teaming up with #AmazonCart, I was nothing short of ecstatic. Woot! I think this new way of shopping online is revolutionary and I had to give it a try. And let me tell you, it was so easy. EASY I tell ya. It took all of 10 minutes (if that long) once I saw a tweet from @Amazon about something I wanted. You can follow one or more of Amazon’s Twitter handles where they tweet out amazon links throughout the day of great finds on Amazon, oftentimes, at discounted prices. 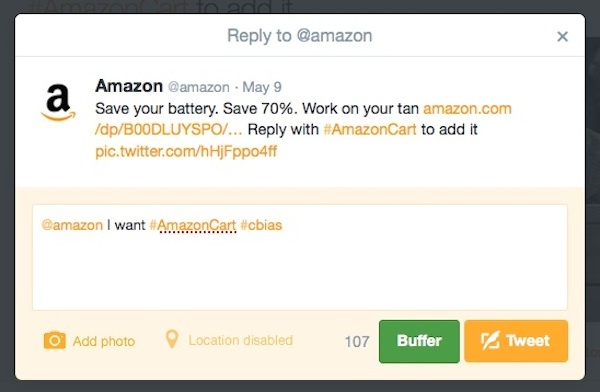 When you see something in your Twitter stream with an Amazon link (it doesn’t have to be from an official Amazon handle, it can be from one of your Twitter friends) that you want, need, just can’t live without, just reply back with the hashtag #AmazonCart. 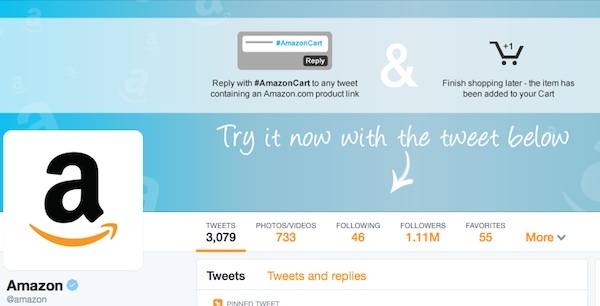 It will be placed into your Amazon Cart right then from Twitter. I saw where @Amazon had tweeted a great deal on a solar panel portable charger on the 9th, so I was afraid it might not still be available or at a great deal… but it was! You’ll receive an email immediately that the item has been added to you cart. Then go sign in to your Amazon Prime account. Go through the same steps you always go through when placing an order. I placed my order yesterday morning and I got it today. Since I’m an Amazon Prime member I generally always get my orders within 48 hours. I ordered the Solar Panel Portable Charger Backup External Battery Pack for my iPhone 5 because we spend a lot of time at the pool during the summer and I need a way to keep my phone charged. It will come in handy at the beach, this summer, too. With #AmazonCart I can get in on some great deals. Plus discover some great finds from my friends. See if I tweet out an Amazon link, you, too, can buy it by replying to my tweet using #AmazonCart. What do you think? 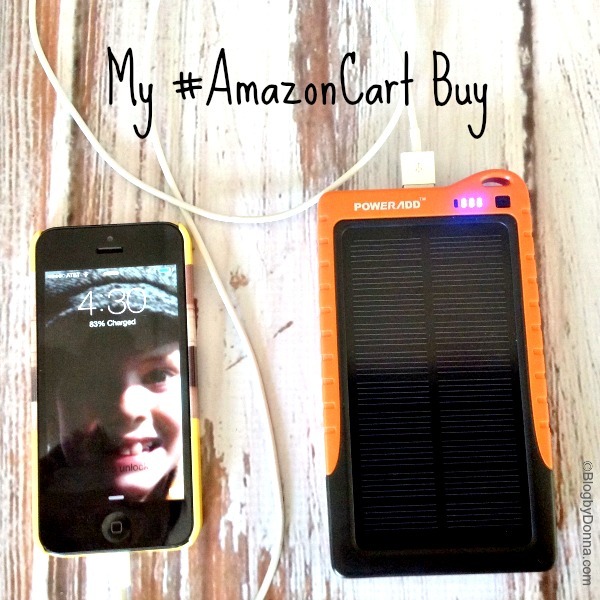 Do you plan on shopping #AmazonCart? I think this is so cool what they have done. I bought a hammock that I wouldn’t have noticed otherwise. I think it’s awesome, too! I felt like I hit the jackpot with my buy… it was like 70% off. I scored big time! This is such a great idea from Amazon but a little dangerous to my wallet!! Wow! I didn’t even know they made solar powered battery things for phones. So cool!! And Amazon is my number one online shopping place. This sounds like goodness all around. Wow- I can see how this would be extremely dangerous to my wallet which since I am semi retired is kind of on the skinny side. I doubt I will use it and I sincerely hope that those of you who do watch what you are spending in total carefully! This makes it almost too easy! Honestly, Michele, I don’t think anyone would be more apt to shop on Twitter than they would straight from Amazon itself. It just makes it easier, plus if someone you know and trust tweets out an Amazon link of something they bought and loved, you know that it’s something you will probably like. I love Amazon and shop it all the time! This is such a cool shopping feature! Way excited about it! I heard this the other day. Glad to hear you like it. Amazon rocks! Amazon thinks of everything don’t they? I think this is an awesome idea. Amazon is amazing! They have such a great service! I’m still having a bit of a struggle to wrap my head around the concept but it sounds interesting. 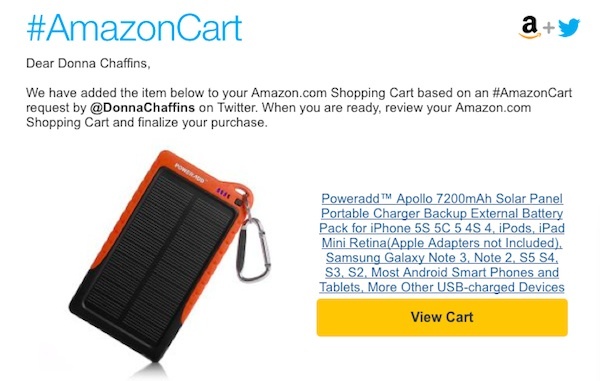 I love that you can order right from Twitter and I’m happy you still got the deal on that solar panel charger. This is awesome, Amazon is my favorite store, I will have to check this out! How awesome! I love Amazon and this would make it so easy to find some great deals. Following a couple of the accounts now! Interesting – I’ve never heard of this. I will have to check it out! I love Amazon and I’m probably one of there biggest customers. I’ll definitely have to check this out! Thanks! Love it! They are always making it easier to get the things we want and need. I really like that you can do it in a second and then carry on with what you were doing. I get way too distracted all the time, so this would help me stay on task. What a neat concept, I’m not sure it’s something I’d actually use but I’d be interested in trying it out at least once. I’ve been hearing a lot about this, I’m going to give it a try! I was just on the Amazon site. This is a really cool service. I love Amazon. I buy from them all the time. This is such a great idea from Amazon! I’m an Amazon-a-holic so this is not going to help my shopping on there. Just another reason why I LOVE amazon. I will definitely be checking this out. Amazon is always coming out with something more innovative and different from the next! I use amazon pretty much every day of the week so thankyou for letting me know the new stuff that is going on! While I absolutely love this idea, I know I could get in some serious buying trouble. Amazon is my true weakness. I need that charger, off to Amazon to find it! #AmazonCart sounds amazing but very very dangerous especially during Christmas season! I keep hearing about Amazon Cart, I need to check it out! We are Prime members but this is the first I’ve known about this. I’ll have to look into it further. I like the fast shipping of our Prime membership, that’s for sure! Wow, what a great new way to shop on Amazon. Thanks for sharing. I am always up for a good deal, sounds neat. I haven’t heard of this yet, so I am gonna follow them all on Twitter! I just started to follow some of those handles thanks to your recommendation! I couldn’t live without Amazon. What a great idea… I may be in some trouble.